Stationery folder is considered as the high utility item to keep the files and important papers safe and secure. It is widely used in offices, home, school, college, institution, bank and various other places to keep the papers arranged and organized. Jute folders have come up with one of the best options to store the files, papers, etc. safe with style. They are highly fashionable and trendy that enhances the ambiance to the decors. With amazing styles, looks and designs, they just add beauty to the place along with high utility. These highly valuable and functional items help the user to arrange the stationery orderly and keep the place neat and clean. Jute folders are highly durable and sturdy that assures long lasting performance without any maintenance. 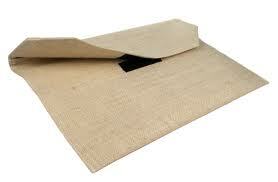 Jute folders can be easily cleaned and maintained with the help of a damp cloth. With their excellent strength, they run for years to come. They are abrasion, heat and fire resistant that also guarantees of their high efficacy. In addition to this, they can be used for any rough and tough usage with their high wear and tear proof property. Handy and light in weight, they can be easily taken anywhere. Eco friendly in nature, jute folders have become the first option for those who look for environment friendly products. With their bio degradable nature, they ensure the safety of the environment. After use, they can be easily decomposed without harming the environment from pollution, gas and other kind of harmful substance. They are aesthetically appealing that comes with their great designs and styles. These innovative folders designed from jute are available in different sizes and striking designs. Jute folders are also available in beautiful colors, prints, paintings and with other adornments. Jute folders are embellished with patch work. Crochet work, embroidery, stones, beads, laces, etc. to enhance the look of the user.